Admittedly I watched this movie for the laughs. I'm hardly religious, so I know I'm not the movie's target demographic. And quite frankly I can't help but have pretty low expectations when it comes to action-adventure style adaptations of Biblical tales. Noah is the big budget adaptation of the story about the great flood, or whatever you want to call it. Given how brief the story was in the book of Genesis, I have to admit that I was pretty curious to see how the heck they were going to stretch the tale out to last more than two hours. What I wasn't expecting was just how weird and strange this movie was going to be given the embellishments to the story. I can take the presence of supernatural rock people, but some of the other stuff was just wrong. I mean really, can we not have a religious movie focus on strange sexual subject matter like what happened here? I'm not even sure if that sub-plot is worth going into detail, but it just got so much attention that I don't really know what to think anymore. It's just as well that I'm posting this review now, just as we get out of a major religious holiday period. Synopsis: Noah is a 2014 Biblical drama written and directed by Darren Aronofsky together with co-screenwriter Ari Handel. I don't quite understand how this movie has a 77% approval rating on Rotten Tomatoes. 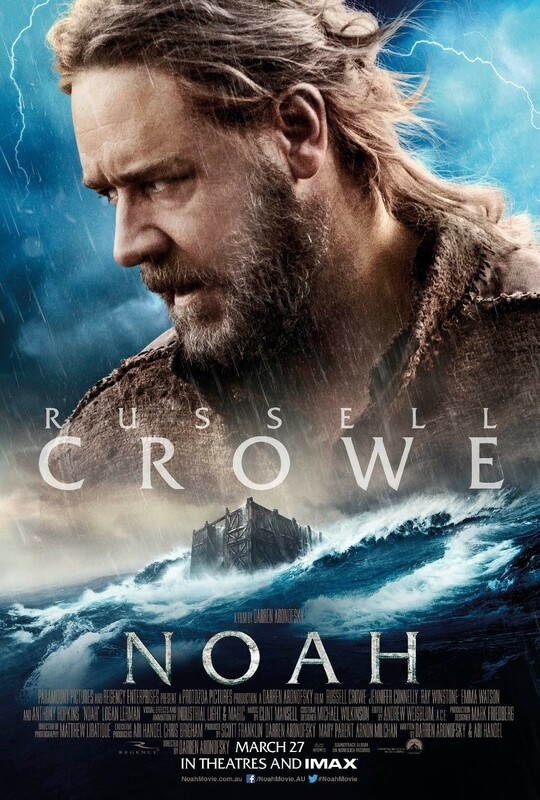 As expected, the movie centers around Noah (Russell Crowe) having a vision of the world being consumed by a great flood as a way to cleanse the Earth of the wickedness of men. He takes his family to see his grandfather Methuselah (Anthony Hopkins) in order to seek counsel and get some sort of advice related to these visions. But during the journey they are harassed by Tubal-cain (Ray Winstone) and his forces, that claim ownership over the lands in the area. They eventually encounter the Watchers, a group of fallen angels who were punished to remain on Earth after attempting to aid the humans after the expulsion from Eden. They once appeared as figures of light, but now their brightness in trapped within massive stone forms, making them appear more like golems. They are reluctant to even let Noah through, but eventually relent and even agree to help build the ark that Noah believes is needed to survive the dark times that lay ahead. I wasn't quite sure how I felt about the decision sort of center the story around how humanity was generally divided between the descendants of Cain, Abel, and apparently Seth and the fact that those who share kinship with Cain were essentially typecast as being wicked. They pretty much serve as backdrop material for Ray Winstone as their tribal leader in a manner that seemed to channel Mickey Rourke to a limited degree. How an entire family can expand to be this race of warriors hellbent on concept is a little beyond me. The Watchers were definitely one of the stranger additions to the story given how they pretty much existed to use up a significant chunk of the FX budget and pave the sway for a massive LOTR-style battle sequence in the end. When you have giant rock people, you're bound to use them to create battles that never existed in the original story. You can only hope that they're halfway decent battles, but I'm pretty sure that you can't describe it as a great or epic one. It simply happened. My main issue with the movie is this weird sexual sub-plot that overly stresses the importance of a woman's ability to have children. With young men defining their masculinity around finding a wife to have kids with, things get annoying rather fast. And then they push things further by repeatedly bringing this plot point up including a totally non-essential climactic struggle on Noah's ark itself. Noah tries really had to be something great, but it ended up feeling more weird and disturbing to me in the end. And I think that we've come a long way since that time to know when not to obsesses over whether or not a woman is barren. So I can only give the movie 1 silly fight scene introduced into the story out of a possible 5.